As the summer has been rolling along, I’ve slowly started to plan some of the trips I’m going to take when I’m abroad. The biggest trip is one to Greek, the Greek Islands, Turkey, Israel, and Egypt, politics permitting, and it is taking a LOT of planning. I’m planning to spend a month working in a hostel in Israel with a friend, so allocating the other month between Turkey, Egypt, and Greece has proven to be something of a difficult endeavor. 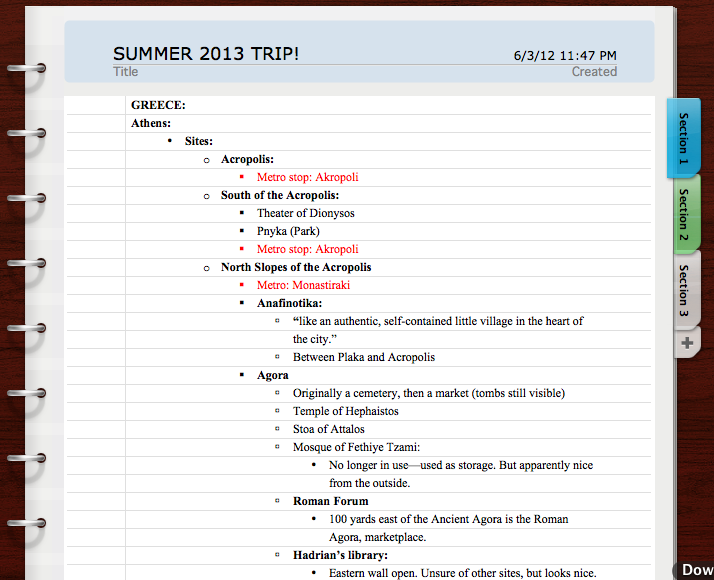 Before I really get into my planning strategies, I should note that I really don’t plan my trips very extensively. 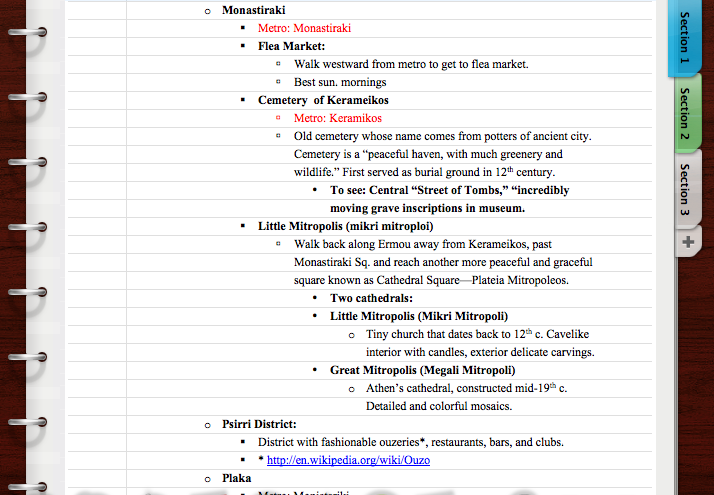 Instead, I prefer to make a very basic outline of sites I’d like to see, note important things about them (IE, what days they’re closed or open, specific hours or clothing requirements, what metro stop its closest to), and then write up a couple of brief outlines for an itinerary. I try and group these places by location, but more often than not these itineraries tend to get thrown out the window, so I use them more for reference rather than as a concrete game plan. Sometimes I don’t even bother writing up any itineraries, but on a trip where there is a lot to see and not much time to see it, I find that its beneficial for me to prioritize my time well and really try and get the sites I’d like to see in, so that way I won’t be disappointed as I’m leaving. I also try to never lock myself into a certain number of days in a place—I like to keep my schedules flexible, and have on a number of occasions chosen to spend more or less time in a place I enjoy more (or hate). The best way for me to build a trip, however, is from the ground up. When I start to plan, I first look at the time that I have to spend, and then look at the time of the year. Oftentimes, I don’t choose the destination right away, but once you have chosen a destination, I’d suggest looking into times of the year when it might be cheap to stay there. I find that its more enjoyable to be in a place that isn’t too heavily populated while I’m there, but I also find that peak season can be a more pleasant time to go given the weather. I then begin to look into flights, and keep tabs on my favorite deal sites. I sign up for alerts on Airfare Watchdog, and frequently check STA Travel for great deals. After this, I usually begin to break things down by day, often using Google as a handy tool to see how much time certain activities, like seeing the Acropolis, might take. Tripadvisor is a great tool for this, and they have the answers to questions I sometimes haven’t even thought about asking yet. Once this is done, you can really start to determine how many days you’ll need in a particular location, and after that everything begins to get easier. After I get the sites down, I begin to shop around Hostelworld for hostels, choose one thats got the best rating for my price point, and voila! I’ve got my trip 98% planned.